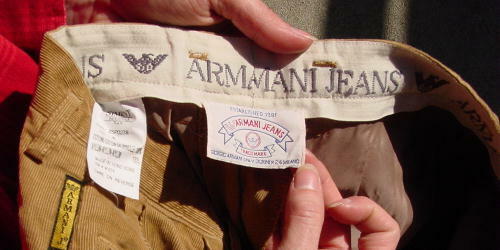 These caramel colored corduroy pants have the Armani Jeans name and logo all around the inside of the waistband. They have two pleats on each side of the front 6 1/2" zipper, and roomy side vertical slash pockets. 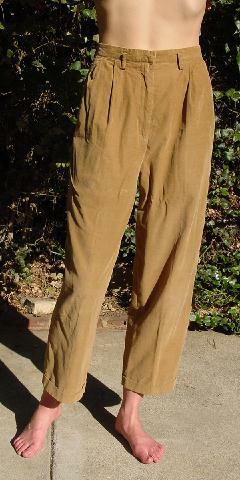 There are two back pockets (the left one has a flap that buttons). 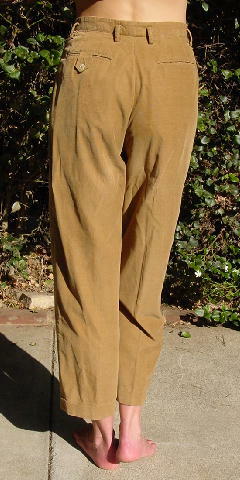 They have wide legs, 1 3/8" cuffs, belt loops, and a covered waistband hook closure. There is a gold and black right side seam logo tag below the waistband. They have 3/4 length lining and the fabric is very soft. They were used in a magazine photo shoot with the vintage multicolored pullover. The model was barefoot walking along the edge of the surf in the Caribbean.